When struggling to meet obligations, the best way forward is to seek help from debit relief advisors. Bankruptcy should never be the first option you consider. The reason for this is because it can help you get out of your current financial predicament but it will surely entangle your finances for years to come. So many businesses in the United States of America alone experience financial troubles. Not all of them succumb to the pressure. Some businesses that survive financial problems end up being slimmer and frugal than before. Finding the right debt relief methods to use can help save your business without tarnishing your credit profile. When dealing with financial problems, bankruptcy declaration should come last. There are other methods that you can use to get out of debt. This post takes a look at some of the methods you should use when dealing with financial problems. One of the best debt relief advice you can get is that on getting a debt consolidation loan. There are certain criteria that your business needs to meet in order to qualify for a debt consolidation loan from nonprofit lenders. The best thing about these loans is that they carry lower interest rates than the one you were previously issued. Making the payments here is much easier. The idea here is to pay off your outstanding loans with the new lender then pay back the new lender using the more favorable terms. As aforementioned, not all businesses will qualify for nonprofit debt consolidation loans. In this case, you should move to the private market. With this option, you will be required to put up some of your assets as collateral for the debt consolidation loan. After putting up your assets as collateral, you will be able to get lower rates on a loan. All in all, it is good to note that this option adds a fair amount of risk. If the loan falls into delinquency, you may lose your assets. In spite of the risks, the debt consolidation loans make a much better choice when compared to bankruptcy. The loan will pay off the original unsecured creditors and move your debt obligations to the single monthly payment. The good news is that you can consolidate all your debts so that you only pay one debtor. No more dealing with multiple monthly payments which may be hard to juggle. Debt consolidation loans are not without a downside. The main disadvantage is the fact that it may take you longer to repay the loan. This is a disadvantage because the creditor will still continue to accrue interest which will be above-prime rates. This will cause you to pay more and limit your ability to save. 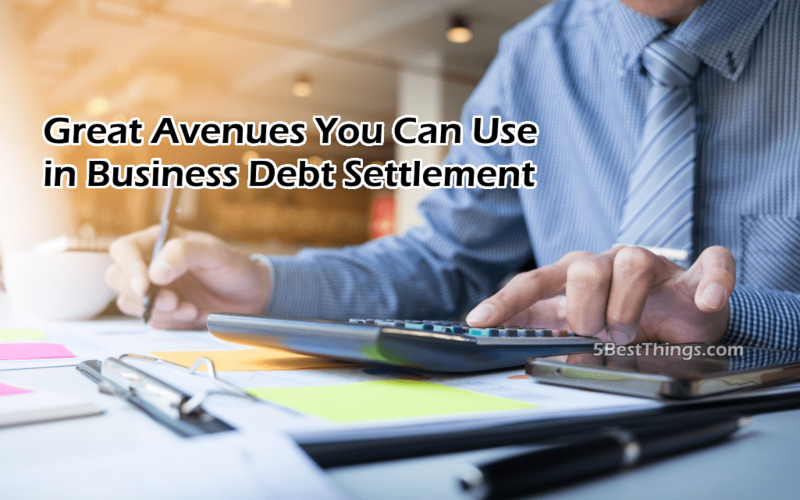 Reviewing alternative business debt settlement options needs to be considered before settling for debt consolidation loans. A credit relief company will recommend that you negotiate the terms with your creditors. At times, the terms and conditions are what may be causing you to lag behind in debt payment. If this is the case, you should not take long to contact your creditor and ask for better terms. Debt settlement should be discussed before your account is charged off. Don’t wait until the debt collection agency comes knocking. Negotiations with your creditor should not involve default on the business debt. The goal should be to make small changes to the payment schedule and the interest rates. Striking an agreement on these can lead to significant changes in the business’ ability to clear the debt. As a matter of fact, most creditors are focused on preventing losses. They are willing to negotiate new terms with debtors. It is always good to work with a financial expert in this step. The negotiations can be heated and considering you are biased, you may not end up getting the best deal. A financial expert has the training and experience needed to negotiate the best possible terms on your behalf. Working with the expert will initially cost you extra money but it will save you a lot more in the long run. The third great option you can use is that of working with the nonprofit credit counseling agencies. They will help come up with a debt management plan that will help get out of debt. The aim of these plans is to consolidate your unsecured debts into one monthly payment. The credit counseling agency reaches out to the creditors and asks for concessions on their interest rates. Once they make an agreement, you send your payments to the counseling agency and it will distribute the payments to the creditors. You may have trouble getting more credit in future. It takes 3 to 5 years to repay all your debts. Your enrollment in the debt management plan will be shown in your credit report and impact your score negatively. Your credit accounts will be closed. You can also consider hiring a third party to settle the debts. This involves a reduction in the amount you owe the creditor. Needless to say, this option will impact your credit score negatively. However, it is better than filing bankruptcy. The best thing about this option is that you get to pay back less than what you actually owe. It is good to work with an experienced attorney when considering this option. Filing bankruptcy is something you should only consider when you have no other options left. The rule of thumb when getting loans is to make sure you take the ones you are not likely to fall behind on. If you start lagging behind, don’t take too long to take action.